When flying standby, sometimes you win and sometimes you lose. This time, we won big time! Not only did we get on all three of our connecting flights from Sacramento to Paris, but we even scored first class on the international flight (Miami to Paris)! Our bikes, however, didn’t get quite the same pampering. Julie’s bike box arrived unscathed, but Mark’s had been opened by TSA and never adequately taped up again. Thank god the bike and all its pieces parts were okay! We discovered a few days later, however, that while opening the box, the TSA sliced through a bit of the tent that we also stuffed in Mark’s bike box. We have a few inch-long slits in the bottom of the tent where it went under the knife. Considering everything that could have gone wrong in transit, this is an inconvenient but relatively minor setback. 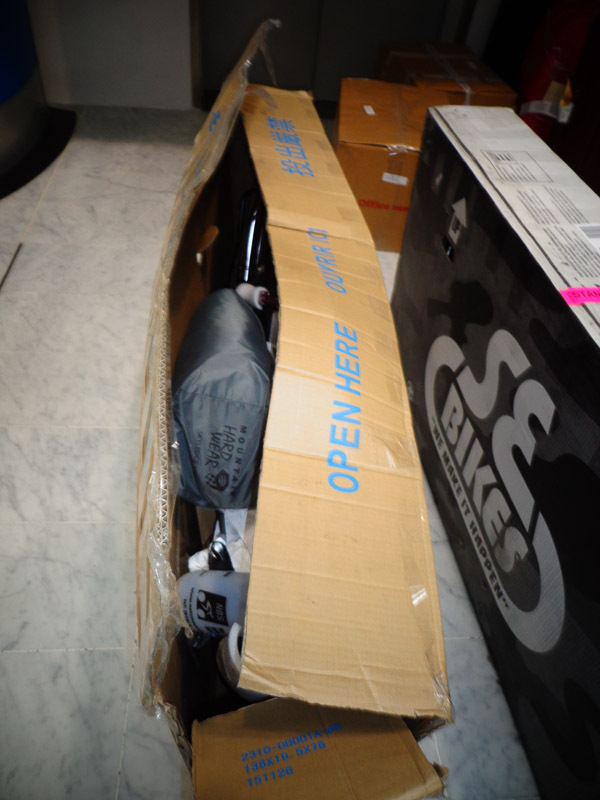 Mark’s bike box upon arrival at the Charles de Gaulle airport after TSA had their way with it. Julie’s (on the right) unmollested by TSA is still buttoned up tight. 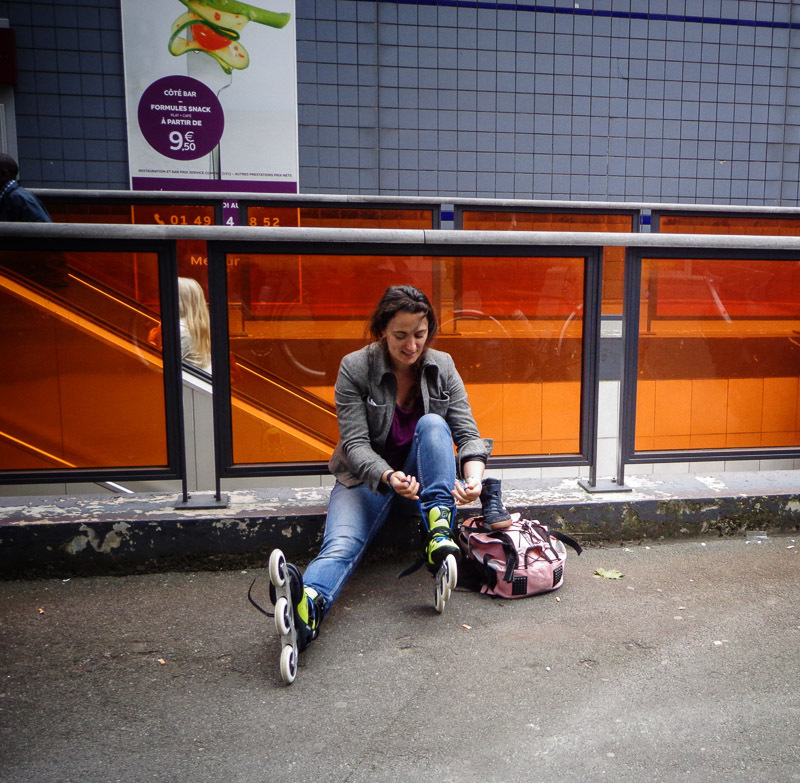 We were met at the airport by our WarmShowers host, Berengere, on rollerblades. An avid rollerblader (as well as cyclist), she skated through the airport to kill time while we built up our bikes behind security. Because the airport floors were smooth as glass, Berengere said she had a great time zooming around the terminal while waiting for us. 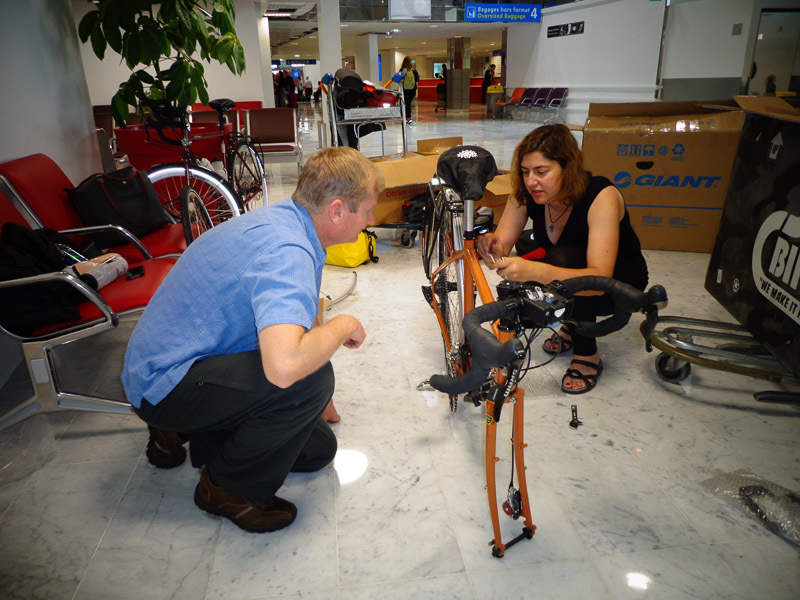 It took us three hours to deplane, get our luggage and rebuild our bikes. Almost finished building the bikes. Notice the reflection of the tires on the floor – smooth as glass and perfect for rollerblading! 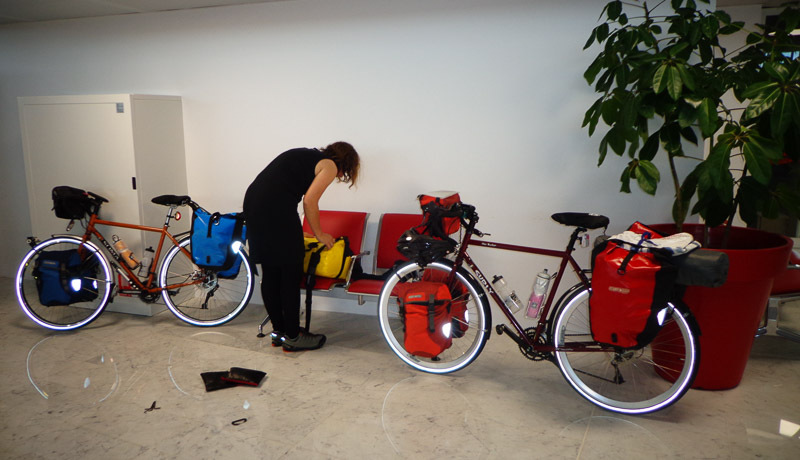 Finally, we rolled our newly rebuilt bikes through security, and officially met Berengere, whose smile lights up the room. 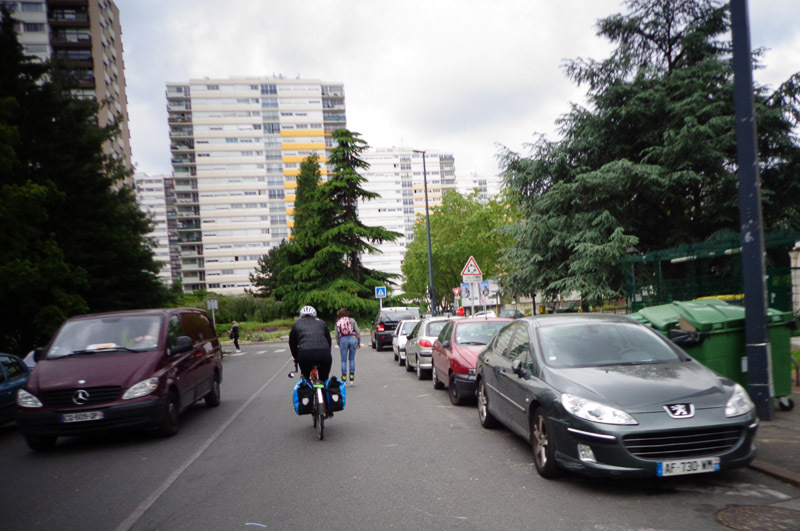 Berengere guided us back to her house in the northern suburbs of Paris, two subway rides and a 5-minute bike ride (or rollerblade) away. Weather was overcast but dry until we got home. Berengere made us a late lunch, we showered, and then we collapsed into bed for a hard 2-3 hour nap. We groggily got up just in time for final dinner preparations. Berengere and her family share their home with another small family. It’s a large 3-story house, cluttered and homey, with DVDs, music and children’s toys throughout. Over dinner, we met the entire household: Berengere and Mattias, with son Driss (4); Sabrina and Nicolas, with son Celestin (2). The two boys seem quite different, but they play very well together. Driss is quiet and intense, whereas Celestine has quite a pair of lungs on him and since he has few words yet, happily screeches about everything going on. They fed us a beautiful green salad with beets, quiche Lorraine and a red pepper and mustard concoction that seemed similar to a quiche to us, but they called it a pie. The quiche Lorraine especially was delicious. The local ham…OMG…we’re really here, in France! And we finished off with a yogurt for dessert. The two families plan to go cycle touring together later this year. And Driss will be able to show Celestin the ropes, as he’s already a world traveler. Last year Berengere and Matthias went on a round-the-world bicycle tour with their then 3-year old Driss in tow. We are in AWE! They said they used Warm Showers on their trip and now they are paying it forward. And boy did they ever pay it forward! We can’t thank Berengere and her household enough! Not speaking a word of French (well, okay, one word: “merci”), we were at a complete loss as to how to get ready to hit the road. We needed to get sim cards for our phone and computer, fuel for our stove, food, register Mark’s visa paperwork, and figure out a route out of Paris. Berengere and her housemates helped us with all of that. They even gave us the key to their house so we could run errands while they were all away at work! Are they awesome or what??? 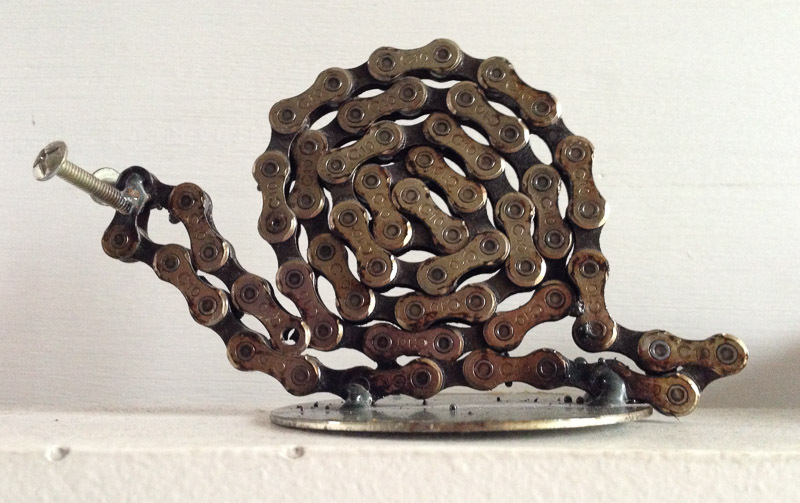 Berengere’s great taste in art: combining bicycles and snails, just like Team Lumaca! And they shared not just one, but two delicious home-cooked dinners with us. We had very interesting conversations around the dinner table about current affairs in France. Evidently there is a newly enacted, far-reaching law in France that greatly impacts employee rights. For several months there have been strikes and protests, with as many as 100,000 people at a time taking to the streets. The men in the household attended the protests during the two days we stayed with them. We might have liked to go with them to see a protest in action, but when they said that they personally have been tear-gassed nearly every day they’ve been protesting, we quickly reconsidered. They said they anticipate that the police are going to respond ever more violently as more and more people turn out to protest. We sincerely hope they stay safe. And that we don’t inadvertently stumble into any melees. Thank you Berengere and household for hosting us for two days and working so diligently to get us launched on our adventure of a lifetime! We are eternally grateful! wonderful start to your trip and enjoyed every word of your Paris adventures..what a warm welcome with the Parisian family! Keep enjoying life, and Bon Voyage! Sounds like you’re off to a great start despite the TSA mishap with Mark’s bike box and the tent. Hopefully a few pieces of duct tape will salvage the tent. Your gracious warm showers hosts are just what you needed after the long flights and to help you get organized to begin the great adventure you’ve been planning for so long. Looking forward to following along on your travels. So glad to hear that you arrived safely and are off to a wonderful start! Merci Berengere et Matthias por tous l’hospitalite a mes amis! Thanks for sharing your first days with your Parisian hosts. What a wonderful arrival. I’m so glad you had such lovely hosts. I enjoyed the pictures too! Interesting that you did rebuild your bikes at your arrival. Last summer I took the box from the airport and unpacked where I was staying (and the opposite on my way back home). 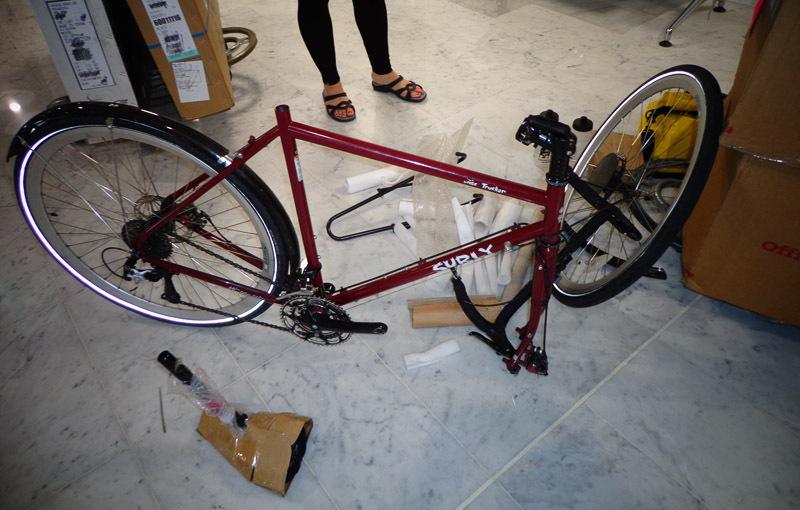 I was too exhausted to do it in-situ, plus it’s probably not the most confortable place to set up a ‘bike shop’, anyway I see the pros too: the status of the boxes can be checked (and claim any damage if it’s the case), and cycle out of the airport should be nice! I’m glad to read that you started so well and you were welcomed that wonderful way! I hope you are staying dry in flooded Paris! Will the flooding in northern France, now widely reported, affect your plans? We can’t seem to escape the rain, but at least we haven’t experienced any flooding. Next Next post: Our First Day of Cycling!